What a day! We set out latish as we needed to finish a report for work before leaving. Having eschewed breakfast in Gulag Towers, we managed to find a nice café for a full English before beginning the walk at about 10.50. 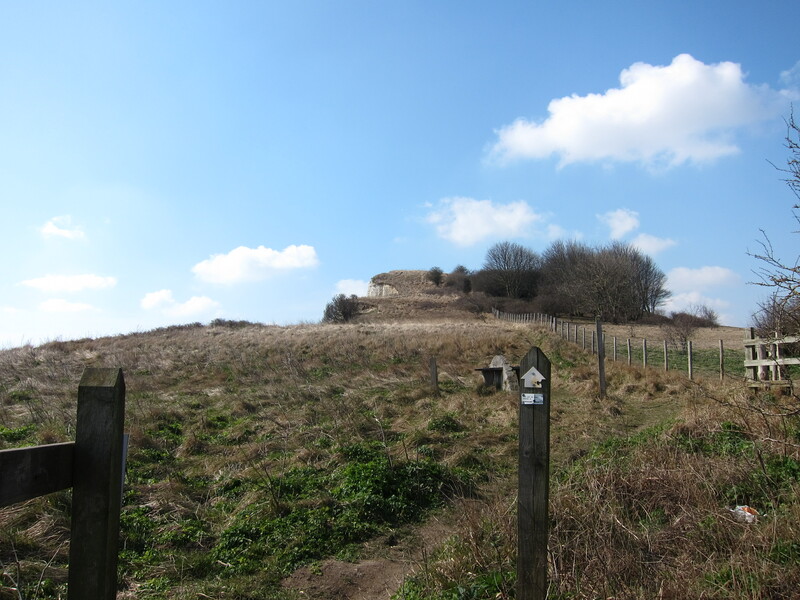 Heading out of Dover, there is a climb up an almost vertical stairway to the redoubt on the West side of the town. 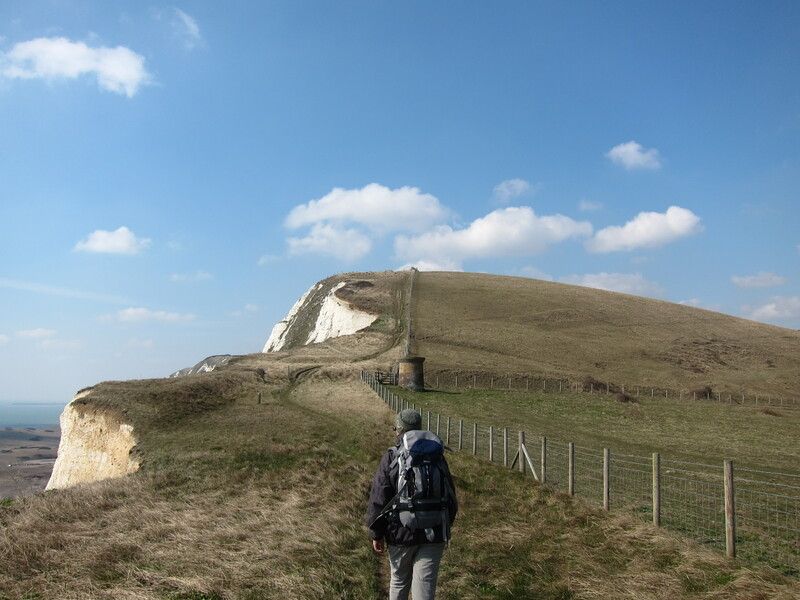 Continuing on the Saxon Shore Way, we walked high above the White Cliffs for some 5 miles, with the first up and down hill of the walk. After about an hour and a half Folkestone came into view, with the harbour pier visible in the distance. I decided to take the Saxon Shore Way inland along the top of the escarpment behind Folkestone, rather than to drop down to the port. I have had enough, for the time being, of road walking along the water’s edge, and the view from the top of the cliffs was excellent. The war memorial to the pilots of the Battle of Britain above Folkestone was both impressive and moving. It is a simple statue of an airman in the centre of a propeller, formed by coloured bricks, looking out across the Channel. Behind the statue is the monument to some 3,000 young Allied airmen killed in the period July – October 1940. 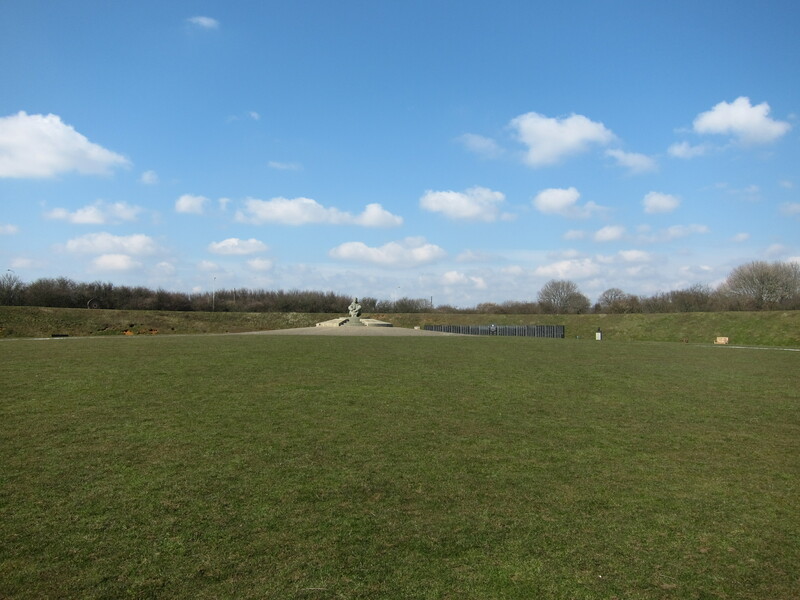 Continuing, we crossed the A260 and then climbed up to what appeared to be an Iron Age hill fort, although it is marked on the map as Caesar’s Camp, directly overlooking the Channel Tunnel terminal – a truly remarkable feat of engineering. Everywhere along this stretch of coast there is evidence of military action and defence, from the astonishingly grand Dover Castle, to the strange sound mirrors and Martello Towers that punctuate the landscape. We dropped down off the escarpment and under the Channel Tunnel rail lines then over the M20, then headed back towards the coast on the Elan Valley Way. 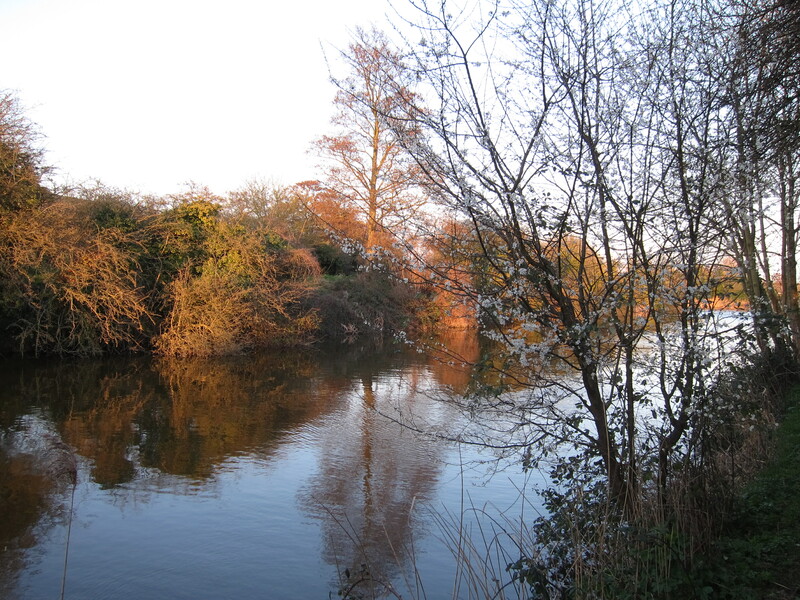 It was now late afternoon, and very pleasant, although the East wind was still chilly. We arrived in Hythe at about 5 o’clock and walked along the pleasant, mediaeval high street. Another of the Cinque Ports, Hythe is full of naval history. We followed the Royal Military Canal Road out of the town, heading directly west. Built in the period 1804 – 1809 to ward off the French, the Royal Military Canal is apparently the longest defensive work in the UK, after Hadrian’s Wall and Offa’s Dyke. You can find out more at http://royalmilitarycanal.com/pages/index.asp Walking along the canal in the evening light was very pretty. The original plan was to walk to Dymchurch, but, having taken the inland route around Folkestone, that was too far, so we planned to stop at the pub at Botolph’s Bridge. Unfortunately, arriving there at about 7pm, we discovered that it is closed on Mondays. Aaahhhh! Our only alternative was to retrace our steps to West Hythe and then walk a further mile (up a very steep incline in the dusk) to reach Port Lympne, where we fell into the pub (the County Members) desperate for food and wine.